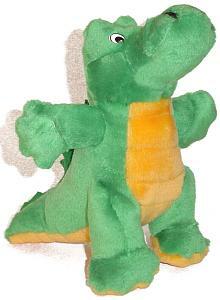 Three green plush alligators. Alligator has a gold belly and green felt "spikes" on his back. Approximately 10" tall, 13" from nose to tail, and 8" wide with arms spread out.